So you’re ready to fast-track your research and build your skills this year, right? Then you need to put on your sneakers and pack a lunch because registration for the third of 2013’s major genealogical research institutes opens at noon eastern time tomorrow. 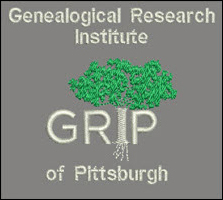 The Genealogical Research Institute of Pittsburgh (GRIP) is the new kid on the institute block, going into its second season at LaRoche College in Pittsburgh. But there’s nothing of a “new kid” feel to the line-up of courses selected by co-directors Elissa Scalise Powell, CG, CGL, and Deborah Lichtner Deal. Every one of the courses is taught by top-flight genealogists and each offers in-depth immersion for an entire week — Sunday July 21 – Friday July 26 this year — in a topic that just might be what you’re looking for. Land genealogy is as important as people genealogy for overcoming family history research barriers. This course explores land distribution in the current United States by colonial powers, private land claims, federal land records at both the National Archives and the General Land Office, and local-level county or town deeds. Students will learn about the Public Land Survey System and the metes and bound system. Course content illustrates the use of land records to prove kinship. Use of software and Internet resources for finding land records, mapping, and deed platting is demonstrated and practiced in hands-on computer labs. The expansion in America’s territory between 1780 and 1840 resulted in a massive migration from New England and New York into the Midwest. As families moved across New York, Pennsylvania, and Ohio they often left a scarcity of records, leaving modern-day genealogists with more than one “brickwall” to solve. This course will explore migration patterns, sources, methodologies, repositories, and other tools to “Bridge the Gap,” when researching during this period. Participants will have the opportunity to participate in group projects to improve their skillset and knowledge. Through lecture, discussions, and many hands-on activities, students will learn how to achieve genealogical proof by planning and executing focused research, citing the resulting sources, testing the evidence they contain, assembling that evidence into a conclusion, and explaining it clearly. Are you beyond the beginning stages of researching your family history? At this point you probably have checked the basic records but still have blanks on your pedigrees and family group sheets. You may need tips on records as well as how to use analytical skills to evaluate them. We will delve deeper into a variety of records, some of which are new to you, and where they may be accessed. During the week there will be some hands-on projects, small group discussions, and full class interaction as we develop research plans, delve into the records, and learn what may get those family blanks filled in. The course covers 19th through 21st century U.S. records and includes online resources. Prior to the course students will be able to send the coordinator a research issue or two along with a listing of the U.S. places where their ancestors resided. The course includes some “homework” that is optional but highly suggested. Students often find they like those learning exercises. An extensive syllabus including online sources is provided. Most military courses look at a war and the records that were created by it. This course is different. This course looks at the history of a type of record and walks it through its life cycle. Most researchers are content to rely on compiled military service records and pension application files alone in their look at the military service of their ancestors. This course takes the researcher into the records that would allow them to compile their own military service records. It takes the pension process and follows it from application through last or final payment. From Old World to New World, the saga of migration tends to be the most dramatic and momentous chapter in American family history. You have researched that story for at least some of your immigrant ancestors and discovered many other stories about your family’s past as well. Now it’s time to share them! Two dynamic instructors are eager to share their expertise and experience to help you write and publish a narrative account of your ancestors’ lives, particularly that pivotal experience of leaving the homeland, journeying to America, and getting settled in a new land. Vivid examples and case studies from colonial times through the early twentieth century demonstrate how to compile the material you’ve gathered; narrate life stories; maximize ship passenger lists, naturalization records, and information found in other immigrant sources; choose a numbering system; document, edit and proofread your text; and publish your work on paper or electronically. Classes explore how to weave oral family lore and treasured heirlooms, as well as pertinent local history, into your ancestors’ stories, and how to incorporate maps, charts and illustrations to enliven your prose. One in-class writing exercise (with follow-up in-class critique) helps you improve practical writing skills, share your special talents, and exchange ideas with the instructors and fellow students. Solid genealogical scholarship and narrative family history writing are not mutually exclusive, but rather complementary. Because this line-up is so solid, class space is going to go fast. If you want in, you need to be ready to go when registration opens tomorrow at noon Eastern, 11 a.m. Central, 10 a.m. Mountain and 9 a.m. Pacific. There are registration instructions on the website so you can be ready to go when registration opens. Good luck getting into the course you want to put your research on a sounder footing in 2013!